An international collaboration of Researchers co-led by a Monash Biologist has demonstrated that methane-oxidizing bacteria – key organisms accountable for greenhouse gas mitigation – are resilient and more flexible than formerly thought. The sampling site used to isolate the methanotroph, namely a geothermal field in Rotokawa, New Zealand. Photo credit: Dr Carlo Carere (GNS Science). Soil bacteria that oxidize methane (methanotrophs) are globally important in capturing methane before it seeps into the atmosphere. It is now known that they can consume hydrogen gas to improve their growth and survival. This new study, published in the esteemed International Society for Microbial Ecology Journal, has huge implications for greenhouse gas mitigation. Industrial companies are using methanotrophs to change methane gas emissions into useful products, for example protein feeds and liquid fuels. “The findings of this research explain why methanotrophs are abundant in soil ecosystems,” said Dr Chris Greening from the Centre for Geometric Biology at Monash University. Methane is a challenging energy source to assimilate... By being able to use hydrogen as well, methanotrophs can grow better in a range of conditions. Methanotrophs can survive in environments when oxygen or methane is no longer present. “It was their very existence in such environments that led us to investigate the possibilities that these organisms might also use other energy-yielding strategies,” Dr Greening said. Dr Greening’s lab concentrates on the metabolic strategies that microorganisms use to persist in hostile environments and he examines this in relation to the key areas of global change, biodiversity and disease. 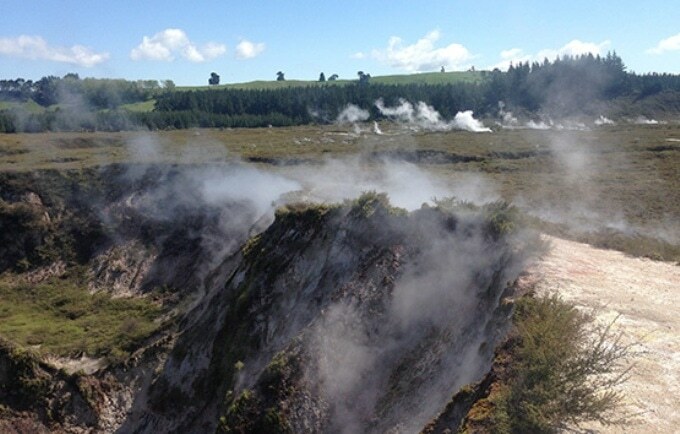 In this most recent research, Dr Greening and collaborators isolated and described a methanotroph from a New Zealand volcanic field. The strain could grow on hydrogen or methane separately, but functioned best when both gases were present. This study is significant because it shows that key consumers of methane emissions are also able to grow on inorganic compounds such as hydrogen... This new knowledge helps us to reduce emissions of greenhouse gases. Industrial processes such as waste treatment and petroleum production discharge huge quantities of carbon dioxide, methane and hydrogen into the atmosphere. “By using these gas-guzzling bacteria, it’s possible to convert these gases into useful liquid fuels and feeds instead,” Dr Greening said. The study was co-led by Dr Carlo Carere and Dr Matthew Stott from GNS Science, New Zealand.